The aim of the school is to impart education, laying stress on the intellectual, physical, mental, social, aesthetic and moral development of the children. The school thus aims at making its own contribution towards establishing principles of social justice, equality of opportunity, genuine freedom, respect for religious and moral values enshrined in the constitution of India in conformity with the social standard of living and etiquette existing in the U.A.E. With this aim in view, the school gives adequate training for the students to become role models with innovative ideas and vision to work for the betterment of humanity. 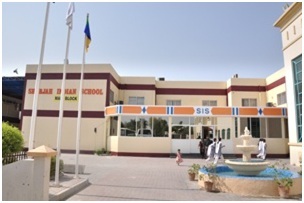 The school is owned and managed by the Indian Association Sharjah. It was officially inaugurated on the 5th of September 1979 by His Excellency M. H. Ansari, the then Ambassador of India in the presence of His Excellency Shaikh Abdul Aziz Bin Mohammed Al Qasimi. The curriculum and programme of work is in accordance with the requirements of the Central Board of Secondary Education in New Delhi. The medium of instruction in the school is English, with Hindi as compulsory second language. Arabic is taught as per the rules laid down by the U.A.E. Education Ministry. Islamic Studies is compulsory for all Muslim children. The children who leave the school with transfer certificate are eligible for admission to any school in India. The school is owned and managed by the Indian Association Sharjah. The administration of the school is carried out by the Managing Commitee elected by the members of the Indian Association Sharjah. The Management of the school has been very sincere and supportive in the growth of the school. They have taken up the progress and development of the school as their prime responsibility and duty and are highly involved in the day to day activities of the school. The Managing Commitee is elected by the members of the Indian Association Sharjah. The tenure of the commitee is one year. The managing Commitee consists of the President, Vice President, General Secretary, Joint General Secretary, Treasurer, Joint Treasurer, Auditor and Committee Members. The school community is grateful to the management for their unfailing and dedicated support and guidance.